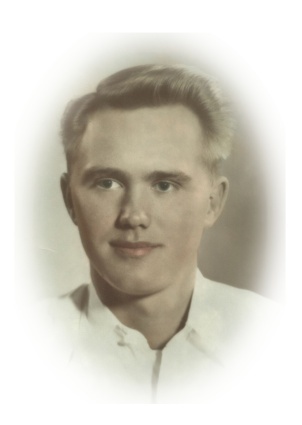 Royal Nelson Kieling, 81 of Prineville, passed away on July 4, 2012. A memorial service will be held at 1 p.m., Saturday, July 14, 2012, at the Calvary Baptist Church, in Prineville. Royal was born on March 9, 1931, in Aurora, Ore., to William Washington and Annie Viola (Nelson-Christiansen) Kieling. He graduated from Molalla High School before attending Portland State University. Royal served three-and-a-half years in the United States Air Force as a Staff Sergeant during the Korean War. He spent most of his adult life in the banking business in Medford, Portland, and Fairbanks, Alaska. He was a manager of Commercial Credit, vice-president of the Bank of the North in Fairbanks for Senator Frank Murkowski. Royal retired as vice-president of the downtown Portland branch of Bank of America. Royal enjoyed writing children’s short stories and poetry, he loved to build birdhouses for his friends. He has been respected and loved by all who truly knew him. He was a member the Calvary Baptist Church, Patriots, and Band of Brothers. Royal is survived by his wife, Gayle Kieling of Prineville; sons, Dean Roy (Tanya) Kieling of Woodburn, Ore., and Randal William (Katie) Kieling of Grants Pass, Ore.; daughter, Carrie Anne Von Kiel of Portland, Ore.; son, Andrew Philip Sloan of Portland, Ore.; step-son, Jack Hess of Central Point, Ore.; brother, William Kieling of Seattle, Wash.; sister, Virginia Dreher of Woodburn, Ore.; eight grandchildren; and one great-grandchild. Contributions can be made to the Humane Society of the Ochocos, 1280 S.W. Tom McCall Road, Prineville, OR 97754. Written by Wayne Hanson Wednesday, 11 July 2012. Reprinted July 16, 2012, from the Central Oregonian, Prineville, Oregon.